Ellen used the quilt as a visual aid for lectures she gave on astronomy in the towns of West Branch, Moscow, and Lone Tree, Iowa. 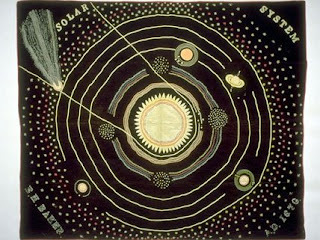 Astronomy was an acceptable interest for women in the 19th century, and was sometimes even fostered in their education. It makes me wonder whether Baker or the children she taught had access to a telescope, and whether any of them dreamed of professionally studying the stars. Baker's story is also a reminder of the hardships of the 19th century. 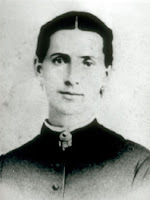 She died of tuberculosis in 1886 at the age of 39, leaving behind her husband and seven children. What a great example of combining career and family! 7 children and she still managed to go lecturing around the state! It wasn't quite around the state - I think those towns are within 5 miles of each other. But it is still a feat.